You are here: Home / Fixed Income (Bank FDs,RDs,PF etc) / Interest on Inoperative EPF accounts | Will I get interest on my Dormant EPF account? But, things are changing for the better. The EPFO has been implementing good initiatives and you can now transfer your EPF funds online and you can also withdraw EPF funds online. In case, you have not been contributing to EPF Scheme for a while and has not withdrawn/transfer the funds from your old EPF accounts then there are chances that your old EPF account(s) would have become IN-OPERATIVE. However, during the FY 2016-17, the Ministry of Labour announced that interest will be credited on in-operative accounts too. Since then, there has been no clarity on this topic. As per the EPFO, the retirement age of an EPF member is considered as 55 years. The PF body will pay interest on all EPF accounts (if full balance is not withdrawn) till up to the members’ age of 58 years. The rate of interest is as declared by the EPFO from time-to-time (every Financial Year). New Definition of Inoperative EPF account : As per the amended definition, an EPF account becomes ‘inoperative’ after the age of 58 years i.e., 36 months after the member’s retirement age of 55 years. 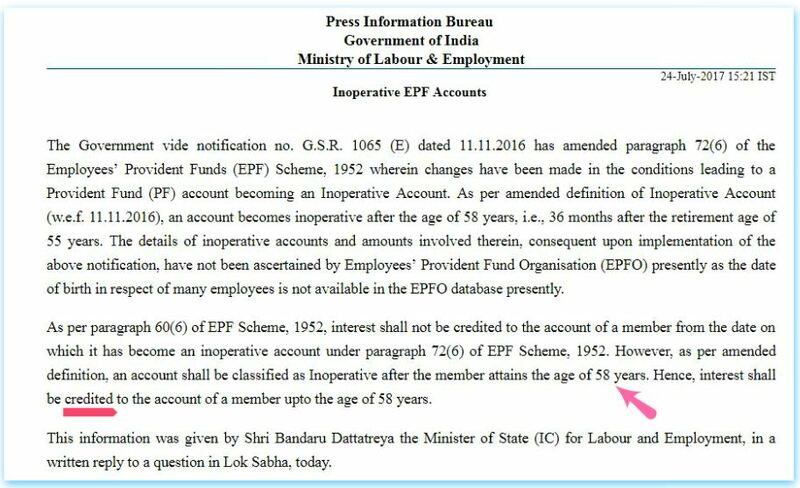 So, it is now clear that an EPF account can be classified as Inoperative after the member attains the age of 58 years only. If you are contributing to EPF Scheme, suggest you to check and verify the correctness of your personal details that are linked to UAN, especially your Date of Birth. Latest update (16-Nov-2017) : If an employee who is a member of EPF scheme, quits or retires from his employment and continues holding the accumulated PF balance, he/she has to pay tax on interest from the date of unemployment. So, the interest on EPF is tax-exempt only when the member is employed and the Interest credited to an employee provident fund (EPF) account after an individual ceases to be in employment is taxable in his/her hands in the year of credit. Interest that has been accrued post employment is taxable. This is as per the recent order by Income tax appellate Tribunal. Latest news (26-May-2018) : EPF interest rate for 2017-18. EPFO notifies 8.55% as interest Rate on EPF for the year 2017-18, lowest in 5 years. How to trace my old & Inoperative EPF account online? How to track the status of EPF claims online? How to consolidate multiple Old EPF accounts? I left my job on February 1st 2019. what do you suggest that should i withdraw the whole amount or should keep it for 36 months more as it would still earn interest. Also could i partially withdraw some amount as i have a medical emergency. Also how can I withdraw the whole amount online as i only get the option of form 31 which is for partial withdrawl. May I know your next career move? As per the latest EPFO notification there is no concept of Dormant accounts. You may get interest beyond 36 months also. Related article : EPF partial withdrawal options and rules..
quit my job in Jun-2016 and i have some amount in my EPF account and i did not withdraw it till now. can i keep that EPF account or shall i withdraw money from it? As per the EPFO’s notification issued in FY 16, all in-operative EPF accounts get interest payment from April 2016 onwards. In your case, you should get the interest amount on your PF balance. Suggest you to cross-check this by submitting a grievance request to the EPFO via this link.. I quit my job from Jan 1st, 2014 at the age of 50, did not take any other employment and withdrew my entire PF ( final settlement ) only in August 2017. I have received interest up to end March 2017. However no interest has been paid for the period April-August 2017. As I have not yet attained the age of 58,shouldn’t I be getting the interest for the above period as per the Nov 2106 amendment and definition of inoperative accounts ? Yes, ideally the interest amount for the said duration is also payable. You may submit your grievance to the EPFO via this link.. I submitted my grievance on the EPFO link as suggested. They have replied that an account is classified as UDA, 3 years after the last contribution is made and accordingly my account is classified as UDA for the FY 2017-18 and hence no interest would be paid for Apr-Aug 2017. The notification regarding payment of interest on EPF accounts came around July 2017 (as given in one of the images in article). But, with retrospective effect from Apr 2016. Looks like, at the same time you had withdrawn the funds and hence they might be referring to old rules. FYI, UDA- Unclaimed Deposit Account.. I had EPF account with previous employer which had contributions till 2003. I switched job in 2003. New company had PF as exempted trust. I did not withdraw any money from previous (non-exempted) epf account. Now if I wish to withdraw money, until what period, interest will be paid? 2006 as it would have become inoperative from 2006? Or it should credit interest for entire period till today as per new rule? Provident Fund corpus to the Senior Citizen’s Welfare Fund. Also I read that the interest earned on pf without employment is subject to tax. Is it payable as per the income tax slab? As per the EPFO, an EPF member can keep the funds in EPF account till 58 years of age. How long your PF account has been dormant? What are the conditions laid down by your Employer’s Trust regarding Dormant accounts? I believe that your ex-employer has to credit interest. Kindly go through this article.. Yes, the interest earned on PF account during non-contribution phase is a taxable income and is taxed as per the individual’s slab rate. I was relieved from my previous company in Dec 2012 and joined another company but forgot to transfer PF account . My PF online statement with previous employer shows final payment from employer in Feb 2013 . It shows both employer and employer contribution in Feb 2013 . From which date my PF account was supposed to become inoperative account as per previous definition . Will 36 months have to be calculated from Dec 2012 or from Feb 2013 . Requesting clarification . The date is based on when your ex-employer has last contributed to EPF..
As of now, there is no concept of In-operative EPF ac, as interest is payable even on PF accounts. If you are employed and currently contributing to EPF scheme, kindly get your PF funds transferred from old EPF ac to latest/new EPF account. I have already transferred my account to current employer . But issue is they have denied me interest from Dec 2015 to March 2016. As per them it was inoperative period post 36 months . They again started giving interest from April 2016 . But I have lost interest for five months . Are they justified in denying interest of five months . If your ex-employer has contributed to EPF till Feb 2013 then your EPF ac would have become inoperative by Feb 2016. But, for these three years, interest is payable and again from Apr 2016, interest is payable on your PF ac. In case, you need more info then you may kindly submit your grievance to the EPFO through this link.. Yes, interest on EPF during non-contributory period is a taxable income. EPFO will pay interest to the member’s EPF account up to his/her age of 58 years.. I observed that the PF passbook of my PF account of previous organisation isn’t showing interest accumulated for 2017-2018. It shows interest updated upto 31 Mar 2017 only. I had left that organisation in Aug 2016 & since then the PF account is not having any further contributions. What should I do so that the PF account reflects the interest credited & updated balance as of 31Mar2018? Another question is why is the Pension Contribution doesn’t earn any interest despite the money lying with EPFO. 1. Will the final Pension corpus have nay interest accured? 2. How is the monthly pension calcualted on the Pension corpus after employee turns 58 years? The interest has not yet been credited to all the EPF members. Not sure, the reason for the delay. But, you are eligible to get the interest on accumulated balance..
Pension is paid on the basis of certain calculation on the accumulated EPS balance. Interest is not payable on EPS balance. You may kindly go through this link for EPS pension calculation. What is the procedure to transfer EPF account from One company(EPF maintained in un-exempted EPFO) to a company(EPF maintained in Exempted/Trust)? You may route the transfer request through your current employer via offline mode (can submit Form 13). 1)will i get interest period for 3 years..from 2013-2016 only? or till date (2013-2018) as per new EPF rules? can i raise the grievance if i wont get interest till date? If no contributions have been made to your EPF ac from 2013, you account would have still got interest payments for next 3 years based on ‘3 year rule’ at that time. From 2016 onwards, based on new rule, your account would have again started receiving interest payments. I have the same issue where I left the Job in April 2014 and got the interest ONLY till April 2017 and no interest paid after that. Did you withdraw the funds? If so, date? You can submit your grievance to the EPF via this link.. Yes, I withdrew funds in May this year as there is no interest is coming. Which reference should I mention while raising the grievance? May this year? May 2018?? Ideally, you should have got the interest from May 17 to May ’18. You may quote your old EPF number and just inquire about the non-payment of interest for the said period. Did you check your EPF passbook and see if there was any interest related entry in it?? Here is the reply I got from EPFO. As on date no circular/orders have been issued/received by/from Head Office New Delhi to/in this Office for crediting interest to the inoperative PF A/cs i.e. beyond 36 months from the date of last receipt of contribution. Suggest you to file RTI and inquire about this! Hi Sreekanth, I had a question regarding the pf withdrawal as, I am trying to claim all pf amount as I have left my job 3 years before and I have not yet withdrawn my pf and I want to withdrawal whole pf and I am trying to withdraw online it says the age is 34 and you are not eligible for 90% withdrawal why this happens as I have not continued my UAN further so I should be eligible for all my PF amount with whatever the interest government is paying on the pf amount even I cannot check how much interest Government have paid please help as I want to claim the whole PF it says I will get the PF after age 58 please advice what should I do. Are you trying to submit partial withdrawal (Form 31)? I am trying to withdraw whole amount for my PF, as I have not continued that PF account and now I want to withdraw the whole PF amount what I paid. I tried to apply online but when I was applying for the same I did not get any option to claim the whole amount I as getting partial withdrawal (Form 31) option and it was return that I can only wthidraw the PF after 58 so please help me I want to withdraw the whole amount. Kindly note that Form 31 is for partial withdrawal. Looks like your ex-employer has not updated your Date of Joining and/or Date of Leaving the organization, hence you are unable to view Form 19 (for full EPF withdrawal) and Form 10c (for EPS). Suggest you to check if these details are available under Service history tab of uan portal. If not available, kindly contact your ex-employer. Dear sreekanth, I am 61years old and with drawn all prior PF accmalated money for earlier 30years of working.. and now recently had worked for 4’years 6 months till July’2016..and could not get job any where for 8months, and again joined another job from 1st,April’2017 and worked till Dec’2017 for 9months. Q1: My total service would be considered as more than 5years or not, please confirm.,so that my accumulated amount is not taxable. Q3: My pension money is accumalated as Rs28,000/00, can I get back this amount or pension paid to me. Request to help me with your recommendations please. 1 – Did you transfer the funds from EPF (2016) ac to the latest one (2017)? If so, the total service period is >5years. If not, suggest you to get the transfer done. 2 – As you are more than 58 years of age now, I believe that EPFO may not credit the interest (if no contributions are being made). Good evening..and thanks for your class cations. 1) I had already transferred funds to the present employer, same UAN number.,and contribution was made till Dec’17 from the just left employer. 2) in that case, when the PF contribution is made till Dec’17, may be my account is active still and why don’t I get interest on accumalated amount PF, for another Two more years. If you confirm that I don’t get interest, then better I will withdraw entire money. Kindly note that under normal circumstances the EPFO pays interest income on all EPF accounts till an EPF member attains the age of 58 years. So, you may kindly re-check the applicability of interest payment in your case with your ex-employer or the EPFO. Kindly read : EPF Interest Income & Withdrawals | Tax Implications | Is EPF Interest taxable? Let us consider a man who quits job before retirement. And he doesn’t claims his pf for several years. Now the question is that for how long will he get interest in it? Dear Abhirup..Suggest you to kindly go through my latest article on this topic..click here to read..
As per the IT ruling, we can infer that the interest credited during non-contribution period is a taxable income. Are you currently employed and contributing to EPF scheme again? I am currently working in TCS, which maintains its PF trust. So If i dont withdraw my PF amount after my Employment with TCS, will I get interest upto age of 58 years even if TCS maintains its PF trust? Dear Bhargav..I believe that you should receive the interest payment, you may kindly cross-check with your employer as well. I also want to about the TDS on PF Interest. Will TDS be deducted on interest if I withdraw PF amount after 5 year of service? Ideally TDS is not deducted on PF withdrawals if service period is more than 5 years. Kindly read : EPF withdrawals & new TDS rules…. First of all, many thanks for such a nice help you are doing. 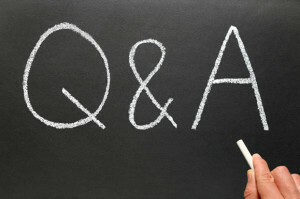 Above all, your reply to individual comments/questions is really appreciated. I am also hopeful to get some response to my query. My case is really unique and tricky. I worked 1 year 7 months in India and then 3 years in Germany. During my assignment in Germany, my social security was paid to my Indian EPF account (as per agreement between India and Germany). I now want to withdraw full amount through the new online withdrawal facility. But, I do not have any resident or NRO savings account in India. I only have NRE account which does not allow credit from Indian accounts. So, I guess I must open an NRO account, then link that account to my UAN (of course, my old employer needs to approve that). But, here comes the problem and my concern. 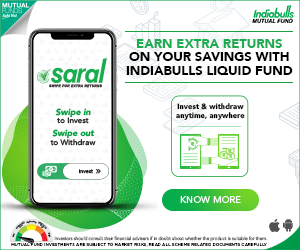 Any deposit to NRO account gets 30% flat TDS! Also, since my service (and therefore contribution to EPF) was less than 5 years, EPFO would already deduct 10% as TDS before transferring to my NRO account. That means, I will get instead of N amount (my current EPF total balance), only (N – N/10) * (1-3/10). How is that fair – double tax of already taxed income. How shall I avoid it? Shall I have to file tax in India to claim over taxed amount? 30% TDS in case of NRO accounts is on Interest income, am I right and not on the deposit amount?? Yes, if service period is less than 5 years, the EPFO can deduct TDS and also such withdrawal is a taxable income. However, if you do not have any other income or your Indian income is less than basic exemption limit, you can file your Income Tax Return and can claim the TDS as REFUND. Kindly read : EPF withdrawals & new TDS rules.. Your posts are super helpful, thank you. I have recently applied for PF Withdrawal with the reason as NRI. I have submitted PAN and 15G form. My employment service is under 5 years with an Indian firm. FP has been processed and credited to my account. According to Passbook, my EPF total (Employer+Employee contribution) is around 3,80,000 and Pension amount is around 21,000. It seems that TDS is deducted on both EPF and Pension amounts as the credited amount is lesser than the ones mentioned in Passbook. EPF is deducted by 10% and credited around 3,49,000 whereas Pension is deducted by 7% and credited around 19,000. Hope that’s the right calculation. My question is will this TDS available in my TDS certificate for the current financial year. If so, when it will appear there? Amounts were credited beginning of this month and these TDS deduction entries are not yet available in my 26A TDS form. Any idea when it will appear? Yes, TDS deducted is applicable for FY 2017-18 (if deducted in this FY). I believe that they may appear by this month end, may be EPFO is yet process the TDS batch of entries.. If you note that TDS is deducted on EPS as well, kindly do update the status here..can be useful for other blog readers and myself…thank you! 1) Can an employee increase his PF deduction above 20% of salary. IS anything in PF ACT about maximum ceiling? 2) Is interest earned on above 20% will be taxed or not? 1 – Yes, voluntary PF contributions are allowed (VPF). 2 – It is tax-exempt income. mY DATE OF BIRTH IS 1951. i JOINED A COMPANY IN 2009 AND THEREAFTER pf WAS DEDUCTED FROM MY SALARY AND ALSO COMPANY ALSO CONTRIBUTED. i RESIGNED IN mAY 2017 AFTER COMPLETING 8 YEARS. pLEASE ADVISE WHETHER i WILL GET INTEREST ON THE pf. Dear Rukmani ji..Yes, you will get the interest amount. I was working in private organisation for 15+ years and quit and started my own business since 2 years. I have not withdrawn my EPF balance (contributed during my service in private company) thinking that I will get interest (tax free). When I recently checked my EPF account, the balance remains the same as it was 2 years back. Does this mean no interest has been added to my balance for these 2 years as there was no contribution. Or will I get the interest at the time of withdrawal. Pl. clarify and also advise if I can keep this money in EPF itself till I am 55, so that the total amount is tax fee. Thanks. Thanks Sreekanth for clarifying/suggestion, I will raise grievance to EPFO on this online. Pl. also suggest if I can continue to keep this money in EPF itself for say another 5-6 years, so that I can get decent interest and the total amount is tax free at the time of withdrawal. Thanks. EPF / PPF is a good debt oriented savings product. In case, you can afford to take risk and have longer investment horizon, you may consider products like ELSS schemes.. I found compliance notice at my IT portal asking me to furnish information or reason for not filing of the returns for the FY2013-14. I check my email and didn’t receive any notification mail regarding this and I don’t know when it was raised. I didn’t file the IT returns because I don’t have tax liability and I thought IT returns are not compulsory if the taxable income is below 5 lakhs. Is it correct? In Fy2013-14 my salary (only) income was 2.7lakhs and the tax amount has been deducted by my employer and paid to dept. I have short term capital loss of Rs.11,000/- in share market. FYI, I didn’t file the IT return in FY2012-13 too. I had started the trading from September 2012 and ended in loss of Rs.27,000-/. My salary income was same as FY2013-14. Please assist me what should I do and how to find the due date for this compliance. If your tax liability is NIL, you may just respond to the notice online with the relevant reason. How to respond to non-filing of ITR notice? Dear Member, your Inoperative helpdesk reference ID: xxxxxxxxx, has been closed with closing remarks “please submit form 19 & 10c along with id proof cancel cheque for further action. can you advice on this please. what i should do for further. You are eligible to withdraw EPF amount. You need to submit withdrawal forms along with the suggested proofs. You may contact your ex-employer too. What will happen if someone goes to abroad for job ( More then 3 Yr) . Dear Tanusree ..Even in that case, EPFO will pay interest on the EPF account till 58 years of age (member’s age).